Simple or bold, the right finishing touches can show off your personality and add to your big-day style. There may be nothing better than scoring the wedding dress of your dreams, but the accessories you add to it (or to that tux, fellas) can really define your wedding-day look. Whether you are searching for a simple accent or a bold finishing touch, the goal is to find something quintessentially you. To help your planning, we’ve compiled everything from bejeweled belts and eye-catching jewelry to perfectly polished shoes for him and her. Cosmic details will help you shine bright on your big day. Give this trend a try with the Jenny Packham Light Up the Night Crystal Burst Cuff ($95 at Nordstrom). The light-catching crystals set across a goldtone plate will make a sparkling and unique statement. 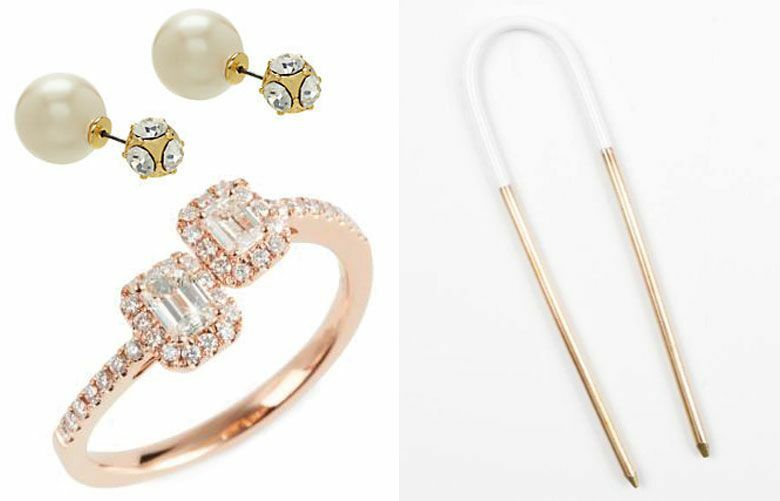 For a simple and chic look, the Kate Spade Dainty Sparklers Reversible Earrings ($38 at katespade.com) are the cool-girl alternative to a traditional pearl stud. For an extra boost of flower power, the J.Crew Floral Chandelier Earrings ($65 at jcrew.com) are an elegant way to finish your look with shimmer and shine. The Bony Levy Stackable Diamond Ring ($2,795 at Nordstrom), in a romantic rosy hue, adds an heirloom-worthy touch to your right hand without distracting from the main event on your left. And a belt packed with pretty stones and pearls, such as the Kate Spade Pearl and Stone Belt ($88 at katespade.com), is a glamourous way to define your waist and add pop to a simple silhouette. A long and lavish veil can bring the drama, even when you’re wearing the simplest of dresses. 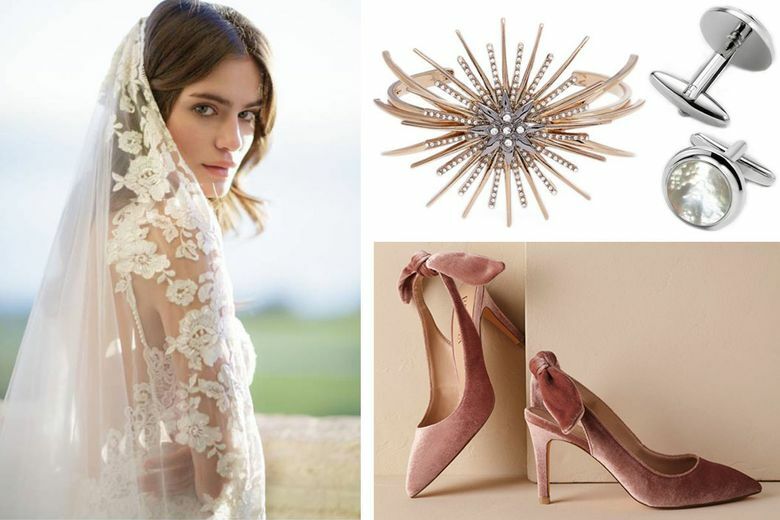 Case in point: The Brides & Hairpins Florentina Embroidered Cathedral Veil ($560 at Nordstrom), an embroidered, floor-sweeping style that makes a statement without distracting from your gown. Not into the look of a long veil? An elegant crown is both classic and on-trend. In gold or rose-gold, the Acute Designs Delicate Rose Vine Crown ($52 at Moorea Seal, downtown) will add a hint of nature to your wedding hairstyle. For the minimalist bride, the barely-there Baleen Dipped Bun Pin ($34 at Baleen, Ballard, and shopbaleen.com), handmade in Seattle, can support a polished updo. Bye-bye, white satin pumps. Shoes are trending as a fun and easy way to show off your personal style. Stay pretty in pink with the velvet Billy Ella Audrey Heels ($170 at bhldn.com), in a deep rose hue with an elegant bow in the back. 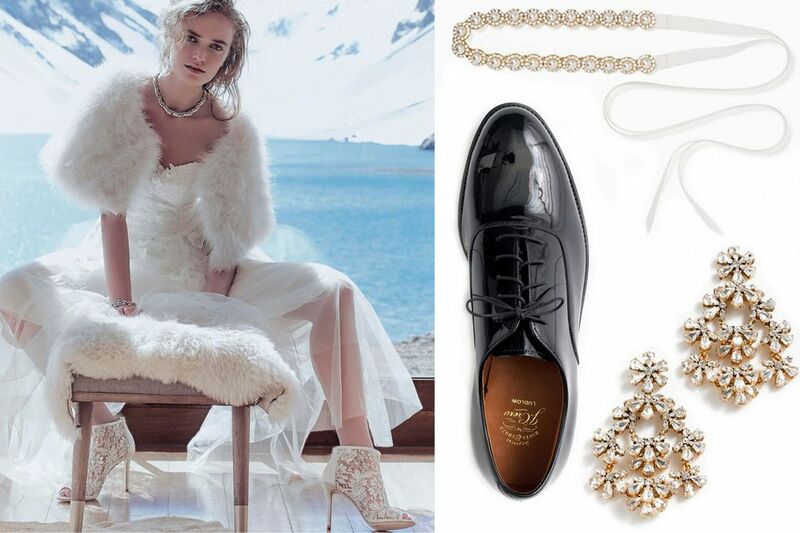 Or make a modern statement in the Badgley Mischka Julienne Booties ($225 at bhldn.com), featuring beading and sequins, floral embellishments, satin backs and open toes to show off a pretty pedicure. 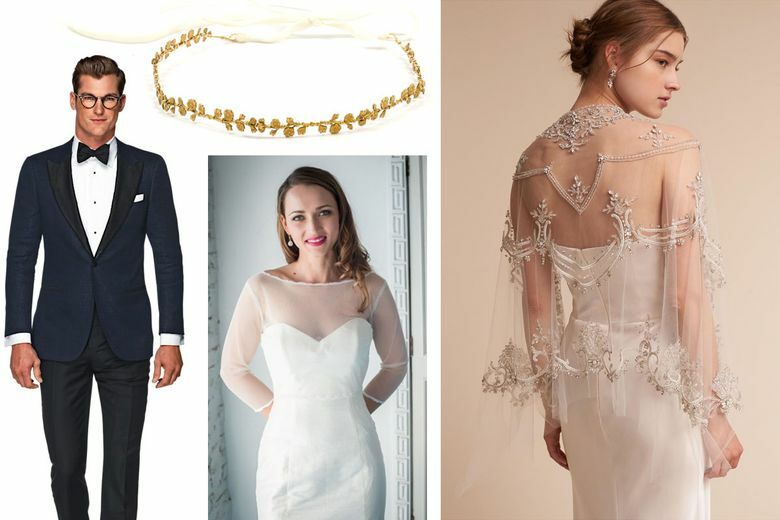 For a fall or winter bride, the locally designed, sheer Cicada Crystal Topper ($295 at Cicada, downtown, and cicadabridal.com), with three-quarter sleeves, cuts the chill a bit and looks chic over a simple sweetheart neckline. A statement piece on its own, the deco-glam Zakaa Elyria Cape ($650 at bhldn.com), in silk organza, is embellished with Swarovski crystals and glass beads that will add texture to a sleek strapless gown. Your bride likely has high sartorial expectations for the day, so do try to keep up. Start with the classic but dashing Suit Supply Lazio Navy Plain Dinner Jacket ($499 at Suit Supply, downtown, and us.suitsupply.com). The silk-trim details pop against the navy linen-cotton jacket, showcasing your sophisticated side. A classic pair of well-made tuxedo shoes are worth the investment. The J.Crew Ludlow Balmoral Tuxedo Shoes ($298) are made from Italian leather and can be re-soled, so they will last you a lifetime. Complete your look with a crisp white shirt and Silver Pearl Cufflinks ($5 for a rental at theblacktux.com). The timeless pearl detailing pairs elegantly with evening-wear and shows that you care about the little details.